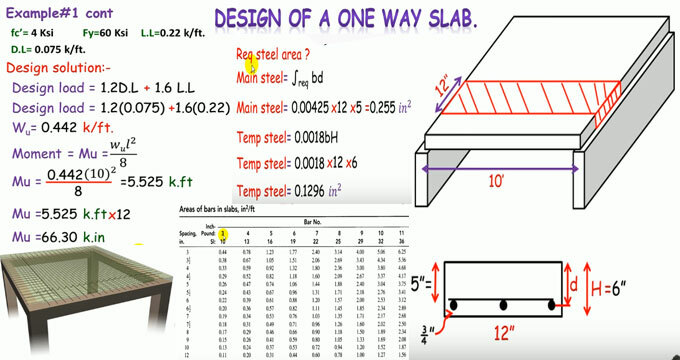 This construction video tutorial will teach you in detail how to design a one way reinforced concrete slab. Slabs are utilized in floors and roofs of buildings and frequently combined with the supporting beams, bear the distributed loads mainly by bending. 2) If the support is provided to a rectangular on all the four edges, the slab is treated as a one-way slab if the length-to-breadth (L/B) proportion of the slab is equivalent or larger than two. 3) A one-way slab is intended for the spanning direction solely; the primary tension reinforcing bars of such slabs operate parallel to the span. Toward the transverse direction, a lowest amount of shrinkage reinforcement is arranged.